• A survey of some 50 works from the Venetian Renaissance will go on show at the Royal Academy of Arts in Piccadilly on Saturday. In the Age of Giorgione features works from the first decade of the 16th century by artists including Giorgione, Titian, Giovanni Bellini, Sebastian del Piombo and Lorenzo Lotto as well as those of lesser known painters like Giovanni Mariani. Highlights include Giorgione’s paintings Portrait of a Man – only one of two known painting bearing a contemporary inscription identifying the artist (from The San Diego Museum of Art) and Il Tramonto (The Sunset) (from London’s National Gallery) as well as Titian’s works Christ and the Adultress (Glasgow Museums), and Jacopo Pesaro being Presenting By Pope Alexander VI to Saint Peter (Koninklijk Museum voor Schone Kunsten, Antwerp). The exhibition will be divided into four sections. Runs until 5th June. Admission charge applies. For more, see Cwww.royalacademy.org.uk. 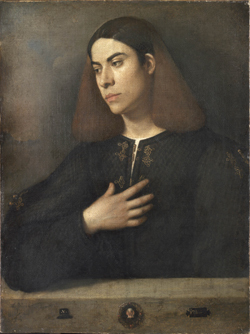 PICTURE: Attributed to Giorgione, Portrait of a Young Man, c. 1505. • Art at the Bridge returned to Tower Bridge this week with an all-female exhibition launched on International Women’s Day. Building Bridges: The Female Perspective, which is being run in collaboration with the Southwark Arts Forum and represents the 7th ‘edition’ of Art at the Bridge, features the work of 15 artists in a variety of media. They include Charlotte Timms, a mixed media artist who takes her inspiration from living on an historic barge on the Thames, print artist Donna Leighton whose work The New Baby is a commentary on the bridges a mother must build with a new baby, and photographer Pauline Etim-Ubah who explores the career of civil engineering through a series of images. Exhibition runs until 31st July. Included in normal bridge admission price. For more, see www.towerbridge.org.uk. • Gain new insights into life inside the City of London Corporation in photographs taken by Martin Parr, the City of London’s photographer-in-residence. Opening at the Guildhall Art Gallery last week, Unseen City: Photos by Martin Parr provides insight into the City of London Corporation’s private ceremonies, ancient and modern traditions, processions, banquets and other public occasions as well as more informal times. Twenty of the works on show will be acquired for the gallery’s permanent collection following the closure of the exhibition on 31st July. Admission charge applies. For more, see www.cityoflondon.gov.uk/things-to-do/visit-the-city/attractions/guildhall-galleries/Pages/guildhall-art-gallery.aspx.